TRUE/FALSE: If two triangles are similar, they have the same shape. What is the coordinate of the point (2,3) if it is reflected over the line ? The point P(3,6) is reflected over the X-axis. Which of the following points will be the coordinates after the reflection? Given the following diagram, which of the following is the length of side “x”? What is the length of side “x”? Naomi wants to calculate the height of a tree. She is 1.2m tall and casts a shadow of 2.75m. At the same time, the shadow of the tree is 10.5m long. How tall is the tree? How many lines of symmetry does this shape have? If a point is reflected over the X-axis, which coordinate stays the same and which one changes? If the point B was reflected over the verticale line x=6, the coordinates of the new point would be (3,4). 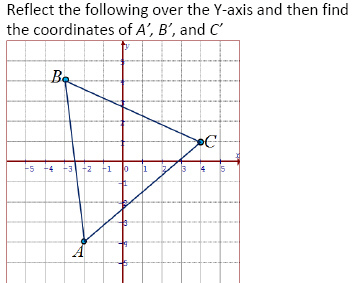 What was the original coordinate of point “B”? Record your answer in the form of (a,b). Which of the following shapes will have the most line of symmetry? Rhombus, Trapezoid, Oval, or Octagon? Which of the letters in the alphabet have only one line of symmetry? Which letters have more than one? If the point is reflected over the Y-axis, which coordinate stays the same and which one changes?